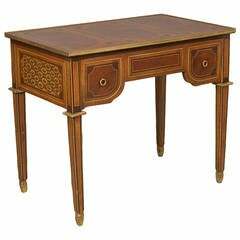 This fine and large bureau plat desk is decadent in both design and materials, featuring lustrous ormolu mounts and a glittering green malachite veneer all over. The desk is of broad proportions and is rectangular in shape, featuring a mounted rim of ormolu around the top and mounted classical busts of women to each corner, which lead down the cabriole legs to terminate in sabots of acanthus leaf form. 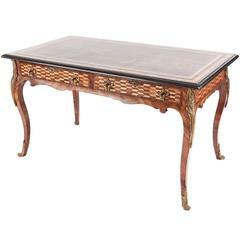 The front of the desk has three drawers, which are all framed with stippled and acanthus leaf ormolu mounts. 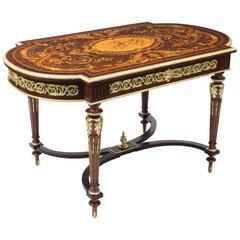 Similarly the other sides of the desk all have similar ormolu mounts, and the reverse features a central classical mask. 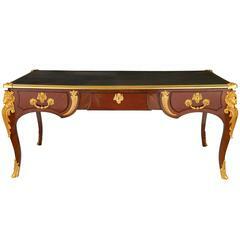 Louis XVI style, one-drawer, hand-painted bureau plat with bronze edging. 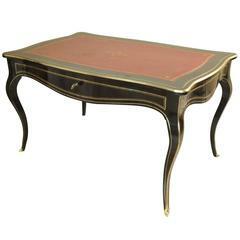 Tapered legs ending in brass sabots and inlay detail on top.